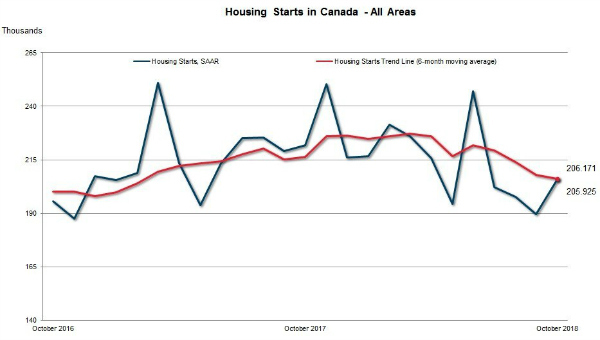 OTTAWA – Housing starts continued their “orderly slowdown” in October, falling on both an actual basis and according to Canada Mortgage & Housing Corporation’s (CMHC) trend measure even though they were up on a seasonally adjusted basis. The trend, a six-month moving average of the monthly seasonally adjusted annual rate (SAAR) of housing starts, was 206,171 units in October, compared to 207,809 units in September. CMHC uses the trend measure as a complement to the monthly SAAR of housing starts to account for considerable swings in monthly estimates, which are largely driven by the multi-unit segment of the market which can vary significantly from one month to the next. The standalone monthly SAAR of housing starts for all areas in Canada was 205,925 units in October, up 8.5% from 189,730 units in September. The SAAR of urban starts increased by 8.6% in October to 191,964 units. Multiple urban starts increased 16.8% to 145,442 units while single-detached urban starts decreased 10.7% to 46,522 units. CMHC classifies ‘urban’ as population centres of 10,000 or more. On an actual basis, starts of urban single-family homes were set a preliminary 4,124 units in October, down 19% from 5,083 units in October 2017. Starts fell in every region from coast-to-coast, ranging from 11% in Ontario to 30% across the Prairies. For the year-to-date, actual single starts totaled 45,476 units – a decline of 14% from the 53,008 units for last year’s comparable period. They fell in all regions except Atlantic Canada where they gained a modest 4%. Multi-unit segment starts – whether for the rental or condominium market – were set at a preliminary 12,911 units in October, essentially unchanged from the 12,904 units started in October 2017. Starts were down in every region of the country, except Ontario where they jumped 87% in one of those significant monthly variations that show up occasionally. In October, apartment construction in Toronto drove the jump. For the year-to-date, multi-unit starts were up 3% to 115,799 units, driven by a 12% gain in Ontario. Starts were also up, albeit by a more modest 2% in Quebec and 4% in Atlantic Canada. They fell in the Prairies and British Columbia. Total starts for the month of October were down 5% to 17,035 units and off 2% for the year-to-date at 161,255 units. Starts were up 4% in Atlantic Canada and by 1% in each of Ontario and Quebec while falling in the Prairies and B.C. In his research note, Rishi Sondhi of TD Economics, said housing starts were better than expected in October which will be good for the overall economy’s performance in the fourth quarter of the year while offsetting an anticipated decline in home sales. “On a trend basis, homebuilding has embarked on what has so far been an orderly slowdown, with softer demand feeding through to starts,” he said, adding, “Looking ahead, modest demand growth should keep a lid on Canadian homebuilding during 2019 and 2020, implying less thrust from what was once a steady contributor to economic growth. “Still, the likelihood of a steep downturn in homebuilding is remote, given that Canada’s population is on the rise, the economic backdrop is decent and that markets are generally not overbuilt,” he concluded.